Colleague and classmate Andria Krewson's blog is blowing up. She's been getting traffic reports through her sitemeter feed showing dramatic traffic numbers (well, dramatic in comparison to the traffic I'm seeing on my blog, where most of the readers appear to be my classmates). A closer look at some of her sitemeter statistics shows that readers are clicking into her blog from the permalinks attached to individual posts. So, how did the readers get to her Global Vue blog if she hasn't done much publicizing of the site? Tags seem to hold the key. For example, look at one of Andria's posts from 10.09. She includes the tag "Google Ads." (If my hits go off the charts for even including that phrase, I'll be amazed.) 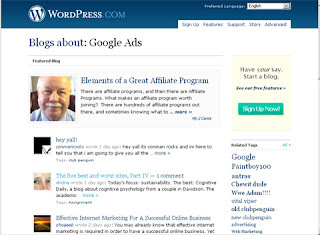 If you click on the tag at the end of this particular post, you're taken to a Wordpress page, Blogs about: Google Ads. The permalink to that particular post is currently the 3rd blog listed. Viola! Big hits when you're a top search result. The lesson: use tags to help you not only organize your blog and help readers find what you're talking about, but to help you expand your audience and your reach in the blogosphere. 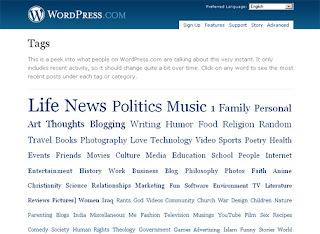 Fun cool site to look at: wordpress.com/tags to see what people are reading.